There are days in the field that provide enjoyment out of all proportion to their circumstances. An interesting area, reasonable weather, congenial company and one or two ‘good ticks’ (records, not arachnids) are some of the elements, but the whole is so much more than the sum of its parts. We had such a day on 28th October 2018. Botanist friend Gordon Rothero was up for the weekend. 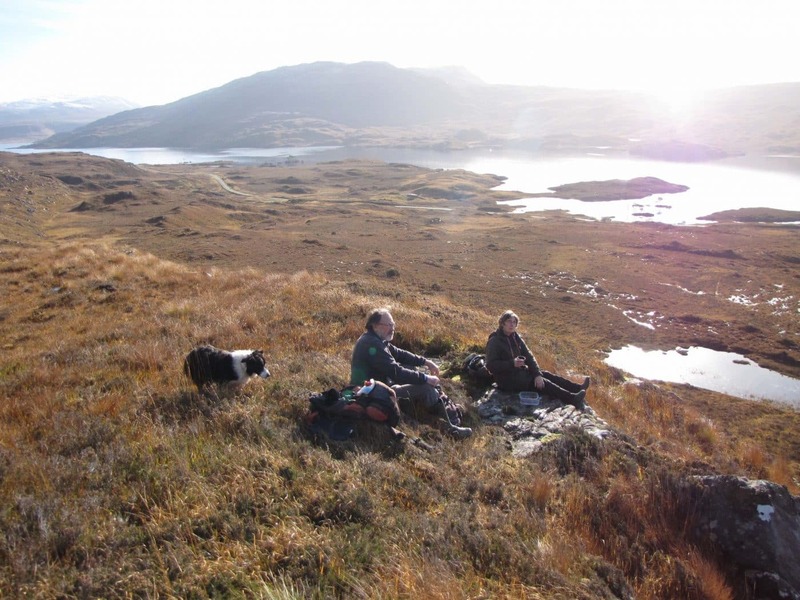 The previous evening we had scanned the map showing the routes of all his previous visits to Assynt (dating back to 1992), looking for an accessible but previously unexplored patch not too far from home. We lit upon a 1km square on the southern flank of Quinag (NC2026). 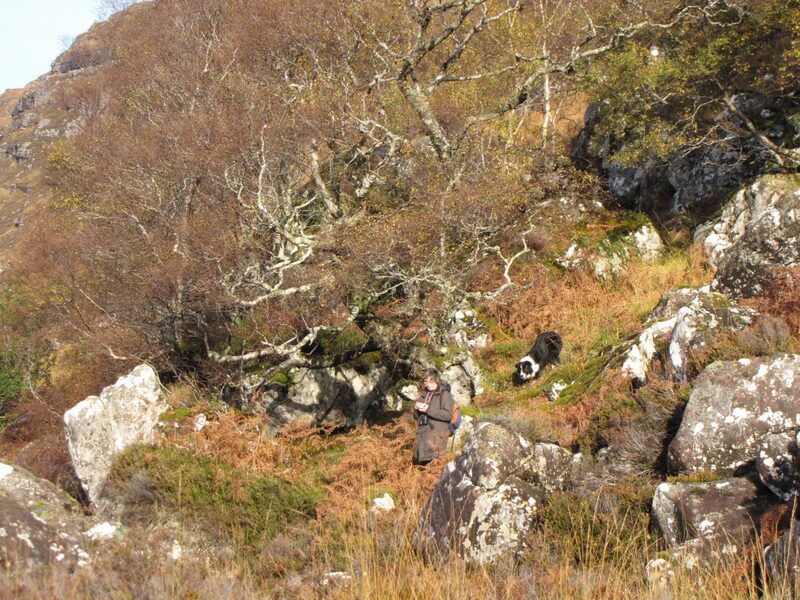 This ascends from 70m at the edge of the A837 to just over 500m on steep slopes above Creag Mhor, although our aim was to explore just the lower part of the hill. We picked up Gwen Richards and her collie Jess at Torbreck and parked in the old quarry beside the Allt na Doire Cuilinn (NC207258). Older editions of the 1:25,000 map (Pathfinder 83) show a track running through this area, precursor to the modern road, and we reached this up the northern side of the river, which was running fast. Turning west along the track, we reached the target square within a few minutes and started recording. I was logging the bryophytes identified by Gordon and Gwen was compiling a list of the higher plants, together with any animal life seen. 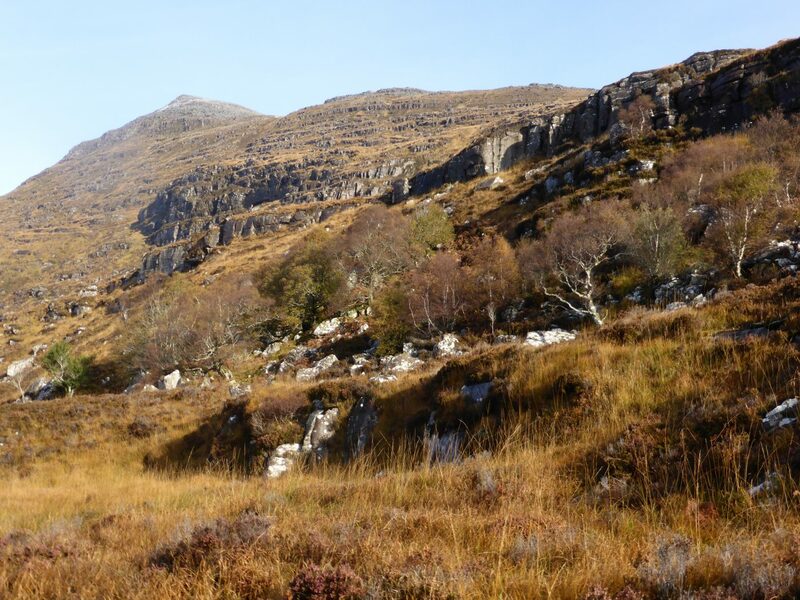 Our Creag Mhor route took us up a small burn towards a patch of woodland on Torridonian block boulder scree (NC207261), with downy birch, rowan, hybrid willow Salix xmultinervis and scattered hollies nearby (photos 1 and 2). Don O’Driscoll of the John Muir Trust, whose land this is, tells me that there was once a badger sett in the area. The flora included typical woodland species such as honeysuckle Lonicera periclymenum, great woodrush Luzula sylvatica and yellow pimpernel Lysimachia nemorum. 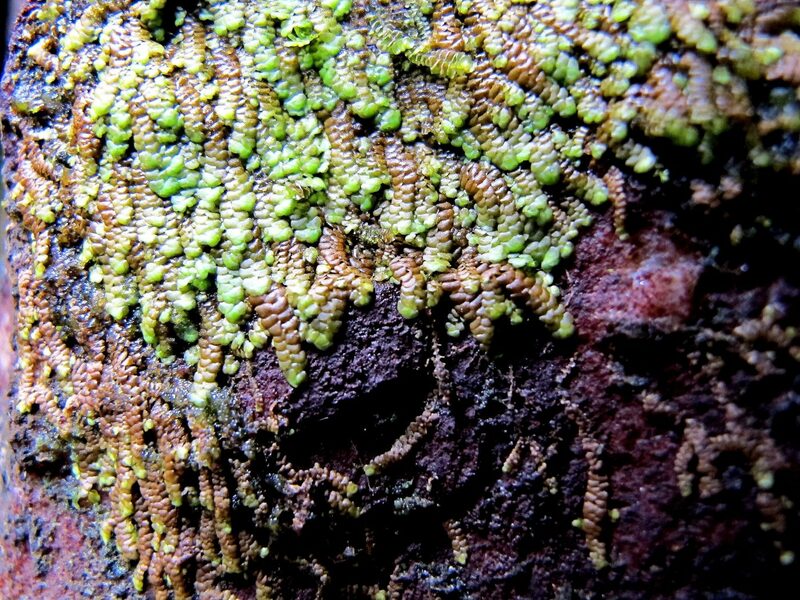 The sheltered habitat bumped up Gordon’s bryophyte list and a little later he came across small cushions of black-tufted moss Glyphomitrium daviesii on more exposed rock (photo 3). 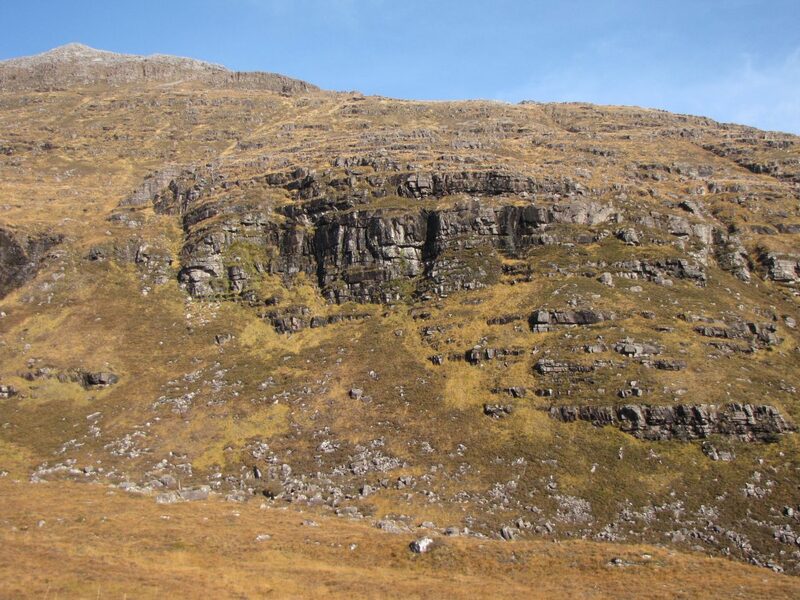 This moss was once thought to be ‘largely confined to the Tertiary volcanic districts of West Scotland’, only just reaching Assynt to the north, but is now known, because of his work, to be widespread locally, although usually on the gneiss. After a short coffee break, we contoured along the hill and dropped down to a small mire (NC205263), which yielded one of few liverworts that grow in such habitats, creeping on the surface of the Sphagnum carpets, bog notchwort Cladopodiella fluitans. More contouring took us to the course of a larger hill burn, which we then followed upwards for half a kilometre, with productive results. 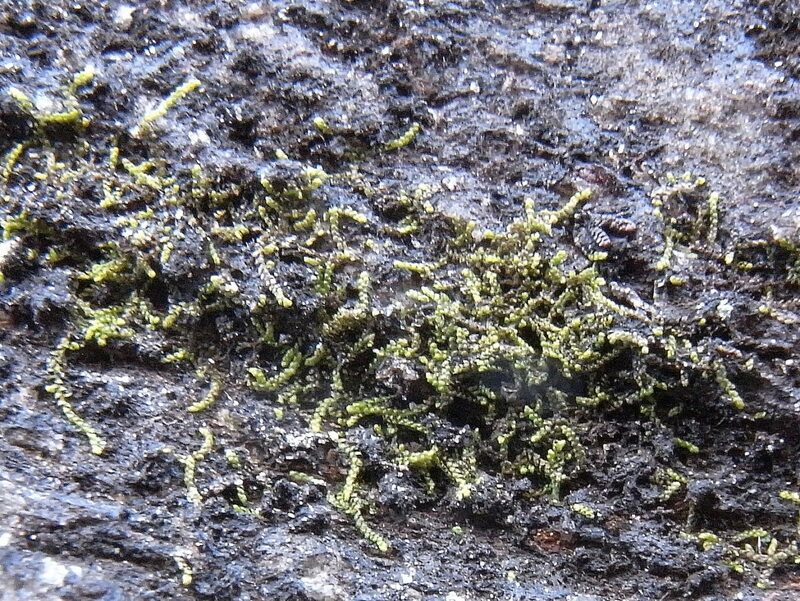 As an example, Gordon found, in just one place, on a vertical rock-face beside the burn (NC204265), several of the ‘tinies’, minute liverworts that inhabit very sheltered habitats, including pointed pouncewort Harpalolejeunia molleri and brown scalewort Radula aquilegia (photos 4 and 5). A little further up the burn, plants indicating base-enrichment began to appear in flushes draining into it, including black bog-rush Schoenus nigricans, tawny sedge Carex hostiana, few-flowered spike-rush Eleocharis quinqueflora and lesser clubmoss Selaginella selaginoides. Gordon spotted the tiny bronze over-wintering rosettes of pale butterwort Pinguicula lusitanica and, a little further up, we came across old fruiting stems of another insectivorous plant, the hybrid sundew Drosera x obovata. Although well past its best, it was identifiable by its size and presence of sterile seeds. 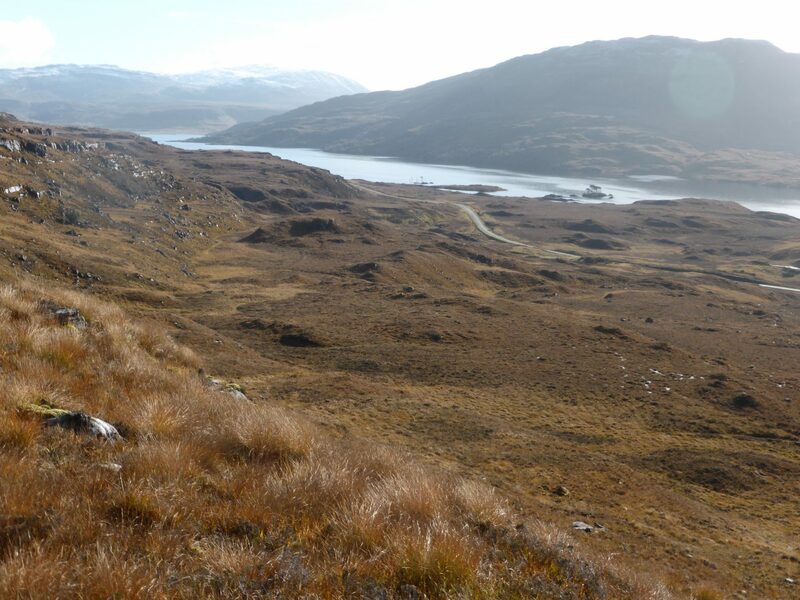 After leaving the burn, we climbed up to a flat ridge (NC202267), with stunning views over Loch Assynt, right through to the snow-covered summits of Breabag on the eastern horizon; a good place for a contemplative lunch break (photos 6,7 and 8). After lunch, Gordon climbed up what he later described as a ‘surprisingly steep slope’ to the base of the vertical black crags below Creag Mhor (NC203268; photos 9 and 10). Here he made some useful additions to the higher plant list, including black spleenwort Asplenium adiantum-nigrum, alpine lady’s-mantle Alchemilla alpina and goldenrod Solidago virgaurea. 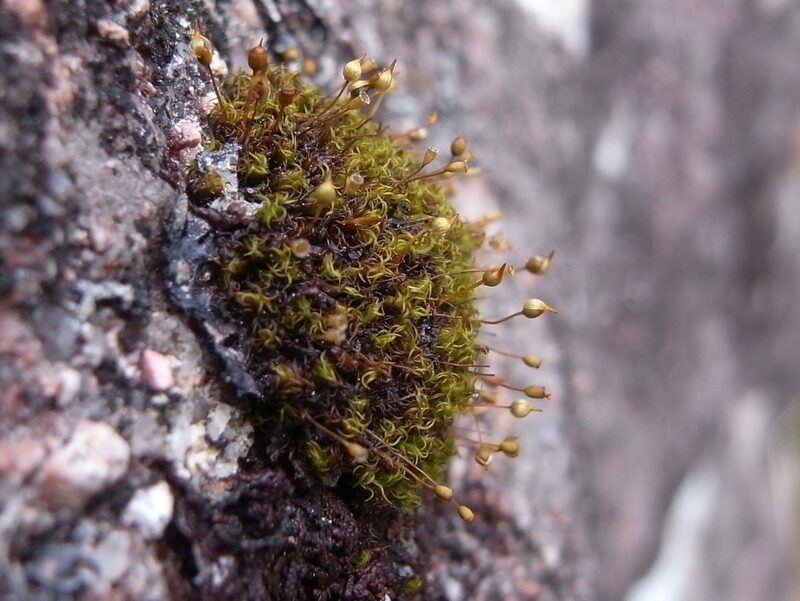 He also logged several bryophytes indicating localised base-enrichment of the Torridonian sandstones, such as comb-moss Ctenidium molluscum, the verdigris tufa-moss Gymnostomum aeruginosum, which is found ‘in crevices kept moist by base-rich seepage water’, and the narrow mushroom-headed liverwort Preissia quadrata, which is described a ‘strict lime-lover’. 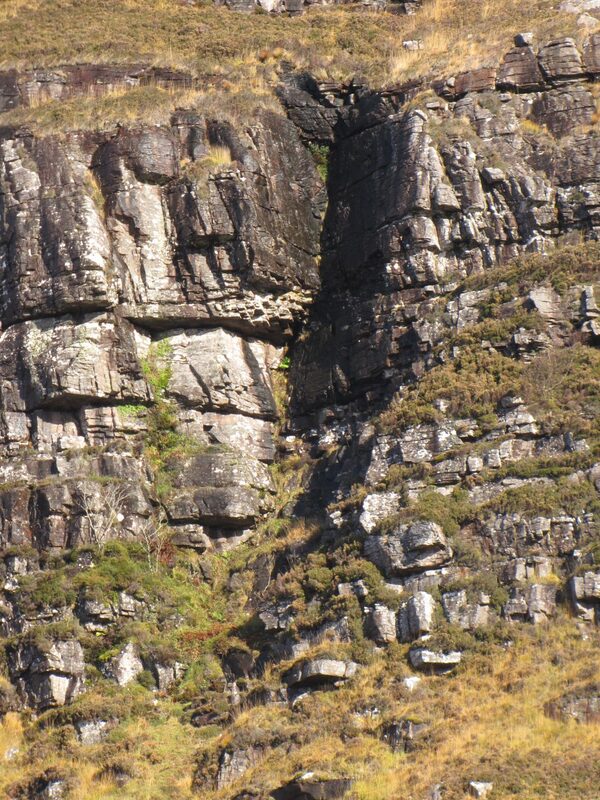 We tend to think of sandstones as ‘acidic’, but in places on Quinag the flora tells us otherwise. Meanwhile, Gwen, Jess and I made our way down steep, wet slopes, dominated in places by tussocks of purple moor-grass, which do not make for rapid or comfortable progress, to the north-western end of an un-named lochan (NC201266, photo 11). 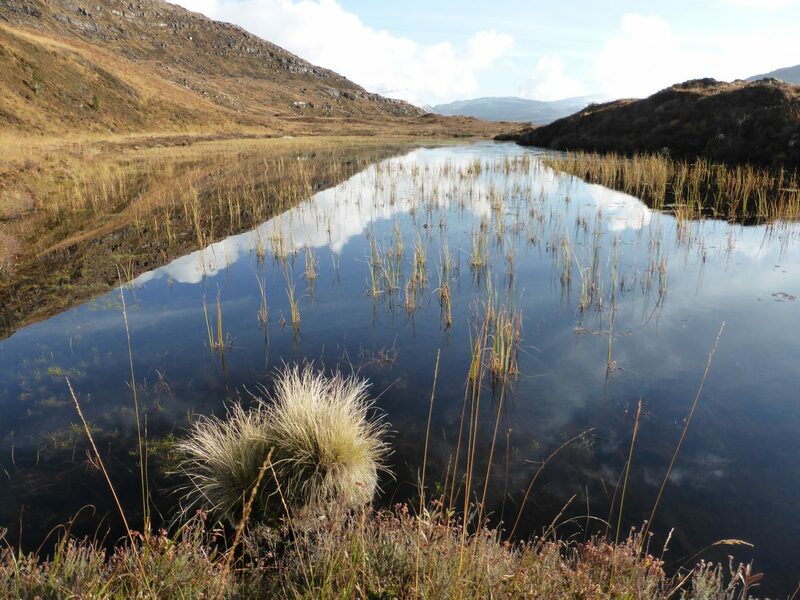 This had a typical hill loch flora including abundant bottle sedge Carex rostrata, an unusual amount of floating clubrush Eleogiton fluitans (photos 12 and 13), water lobelia Lobelia dormanna, and white water-lily Nymphaea alba in a sheltered bay at the eastern end. 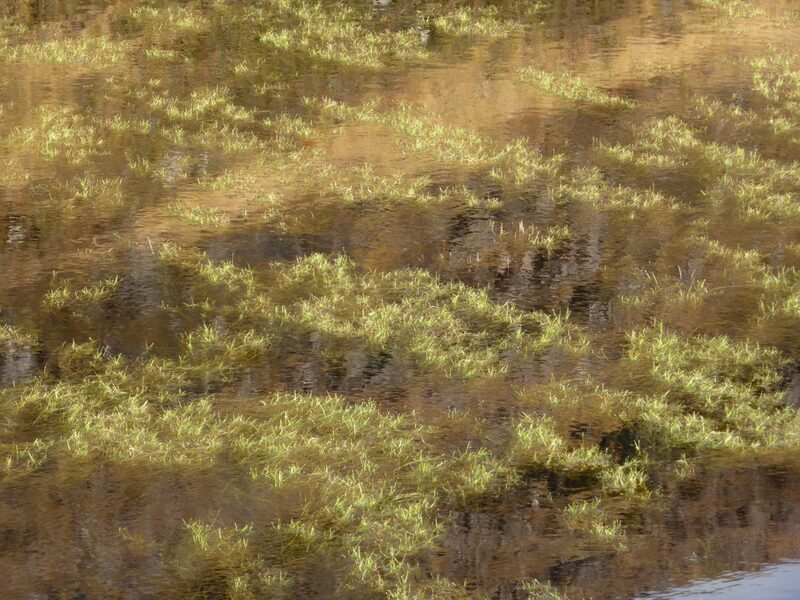 We collected a sample of a locally abundant stonewort which proved to be the widespread Chara virgata, a species that is able to tolerate rather lower pH values than most of its relatives. 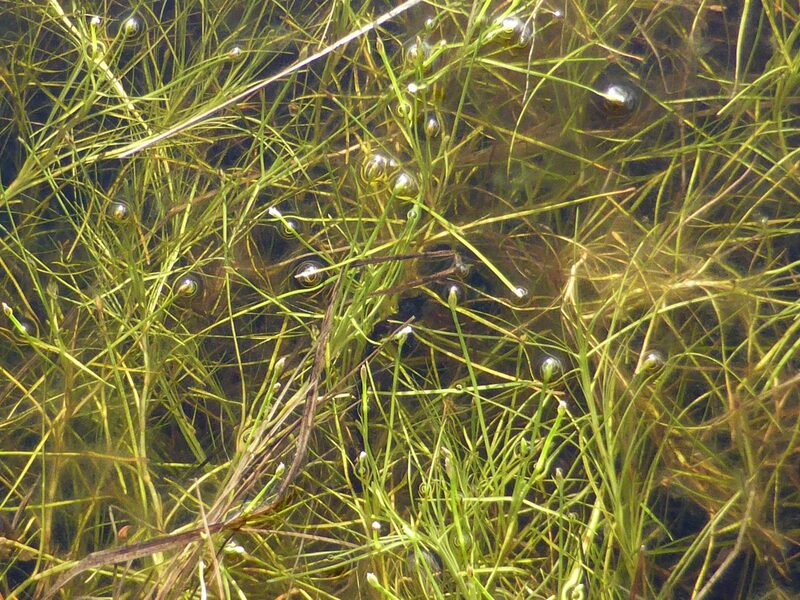 From the stonewort I optimistically extracted material for examination by an old friend, David Williamson, a specialist in the microscopic green algae known as desmids. 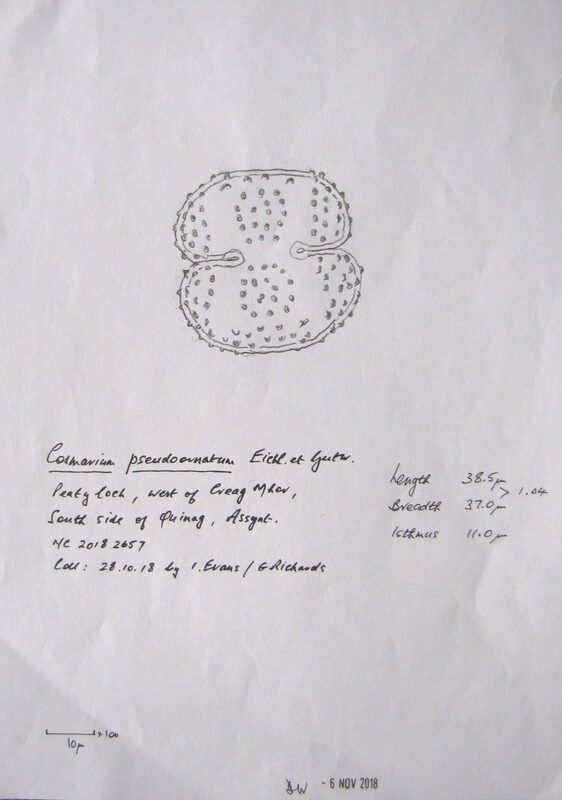 He later reported that ‘after a prolonged search’ under the microscope, he had identified examples of 12 species, including two that are ‘not often found’, Closterium archerianum var. pseudocynthia and Cosmarium pseudoornatum (photo 14). Shortly afterwards, Gordon re-joined us, looking quite pleased with himself. 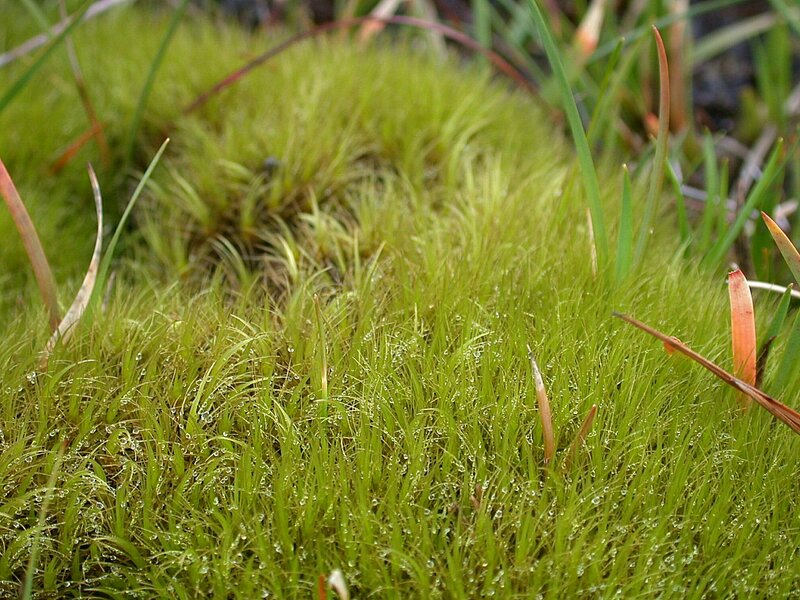 Making his the way back from the crags, he had found, on a wet slope not far above the lochan (NC200266), a good stand of what he later able to confirm, under the microscope, as Shaw’s swan-neck moss Campylopus shawii (photo 15). He says of this moss in the Flora of Assynt, ‘this beautiful hyper-oceanic species has one of its few mainland localities in Assynt, on open peat in a flushed mire area on the bealach south of Creag na h-Iolaire’, where he found it on 17thFebruary 2001 just over a kilometre to the west of this new site (and in another 10km square). 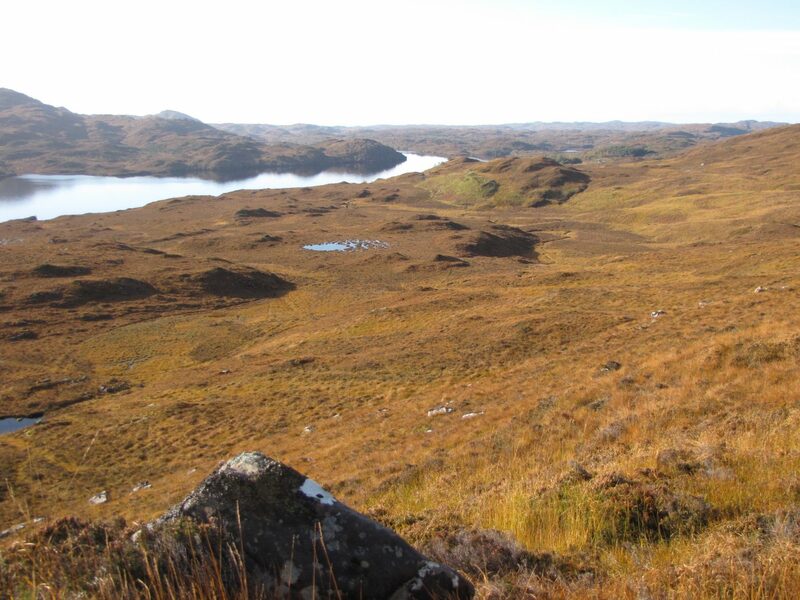 He has since come across it at a couple of places further north, below Arkle and south of the Kyle of Durness, but he is one of very few bryologists to have recorded it in the north-west Highlands. Having ‘plodged’ through an extensive saddle mire (photo 7) containing large amounts of white beak-sedge Rhynchospora alba and one of the less common bog-mosses Sphagnum magellanicum, we then made our way downhill back to the car. The expedition was rounded off with a welcome cup of tea back in Gwen’s hilltop house at Torbreck, where her conservatory affords splendid panoramic views of the local hills. For the record, the tallies for our six hours on the Creag Mhor were 76 bryophytes and 94 higher plants, a good haul for the last serious fieldwork of 2018 and a most enjoyable day out.